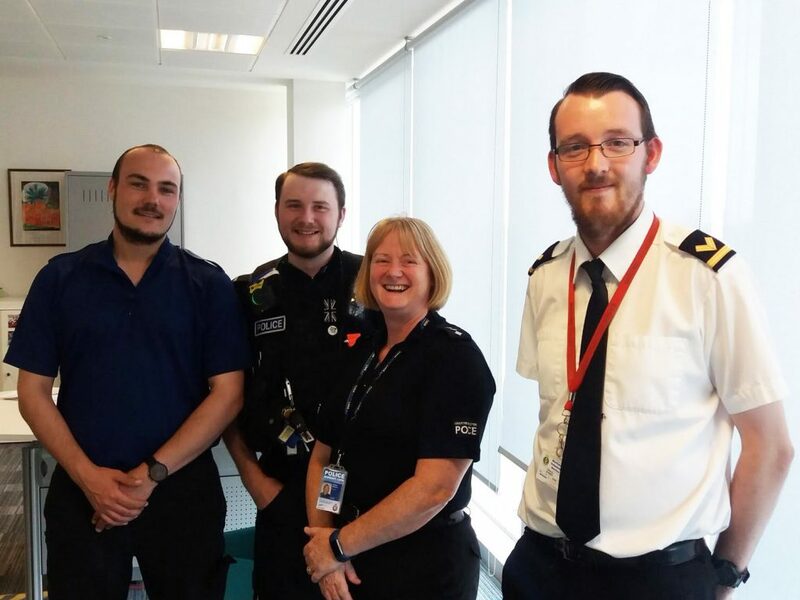 The Port of Manchester Unit have been training Greater Manchester Police Special Constables in subjects ranging from cold water shock to rescue techniques when someone is in distress in the water. The unit is hoping to follow this up with practical skills training out on the water next year. On the night GMP Specials Chief Officer Mike Walmsley attended and was pleased to hear of plans to train other specials across Greater Manchester. “It was great to see Anthony and Adam from the Maritime Volunteer Service at one of our training sessions” he said, “Their passion and knowledge of all things around water safety was clear to see”. HoU Anthony Bonney said, “We had a fantastic time training the specials in water safety and we see this as a great opportunity to build partnerships and help give something back. We look forward to the next session where the specials can learn the practical side to water safety”. Picture: HoU Anthony Bonney meeting with GMP officers to discuss water training.